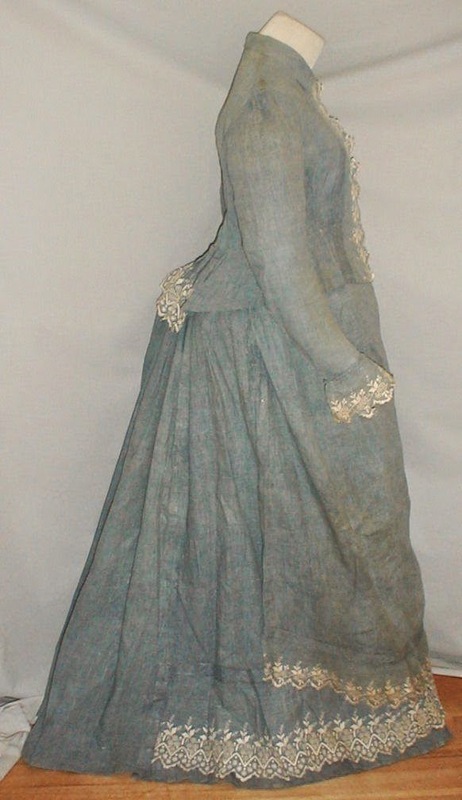 A fetching 1880’s blue denim colored summer seaside bustle dress. The dress has been de-accessioned from a museum collection and the cataloging tag is stitched inside the bodice. The front of the bodice and sleeve cuffs are trimmed with white embroidered flowers and leaves. The embroidery has a scalloped edging. 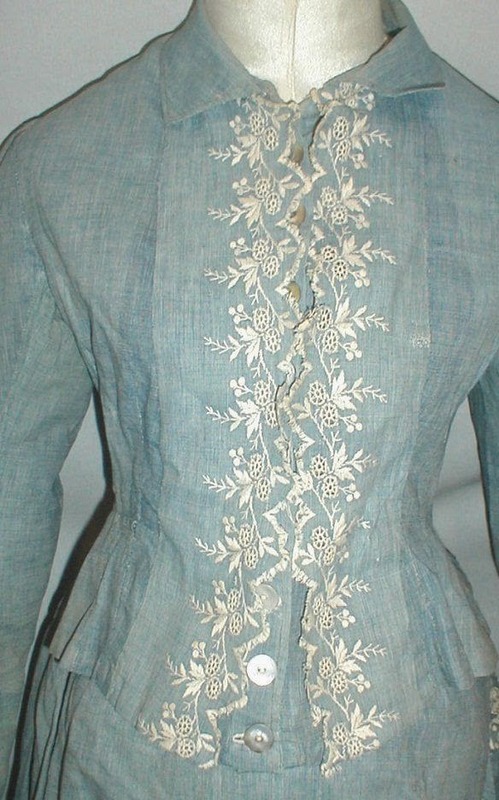 The bodice is unlined and has a front button closure. The skirt has a draped apron front that is embroidered in the same manner. 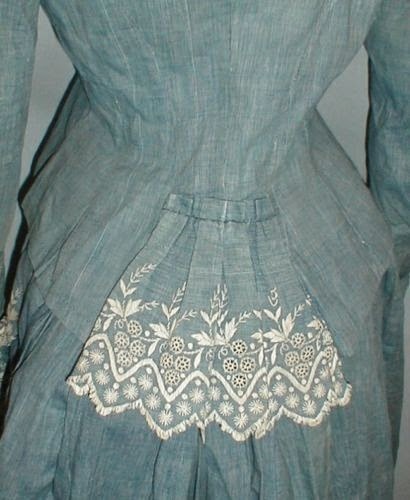 The bottom of the skirt has a wide embroidered ruffle and the hemline has knife pleating. The skirt is unlined. The dress is in very good condition. There is no underarm discoloration and no holes. There is some fading of the color on the bodice. The skirt has a line of age discoloration on one side. It appears darker in the photos then what it actually is. There is a loose seam on the bodice and the waistband on the skirt that will need minor re-stitching. 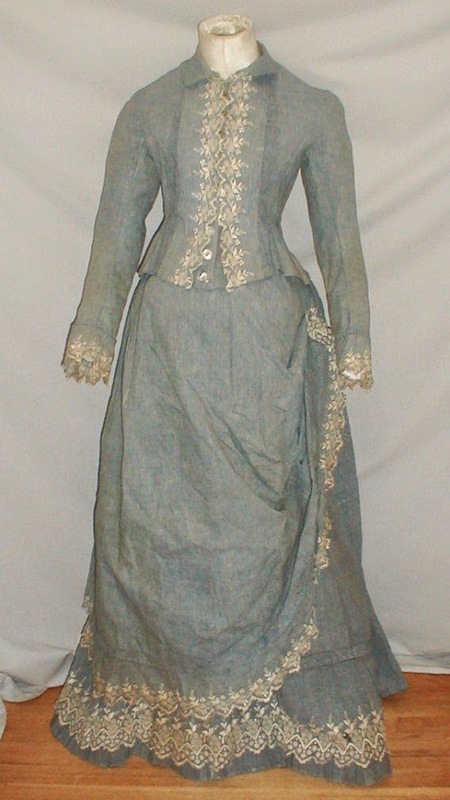 A most attractive display dress. Bust 34 Waist 26 Skirt length 41. First off, it's indigo dyed not denim colored. Denim is a specific weave. One I happen to be wearing right now - as I'm sure many of you are. 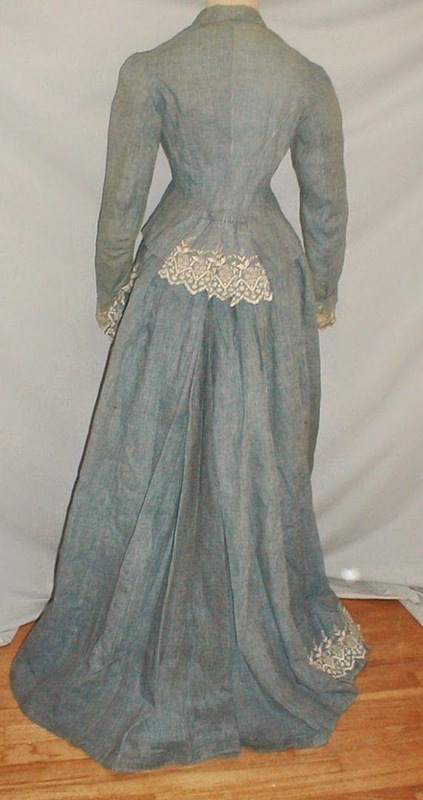 Second, based on the flared waistline and the simplicity of the dress, I'm thinking 1870's. The sleeve style would also indicate the earlier date. I'd forgotten the coolness of a hoop. I've only worn a bustle with a dress made of heavy material -- wonderful when the hotel has the A/C cranked up tooooo high. I froze once wearing full black velvet Tudor, outdoors, in about 75F weather because of the hoop. My fingernails actually turned blue much to the amusement of my friends. I do have a decent heat tolerance but I've also learned that wearing very light materials all over is way cooler than wearing only the minimal amount. The sun directly on your skin is going to cause it to feel a lot hotter than having a super puffy hanky weight linen chemise sleeve between the sun and your skin. As long as you leave your upper chest free for the heat to escape, you stay pretty cool. Definitely! I love the hanky weight stuff Joanns sells. It's Linen/cotton mix but that's period correct and it's super comfy. I need to make a couple more (or five) before July 25th. Eek! 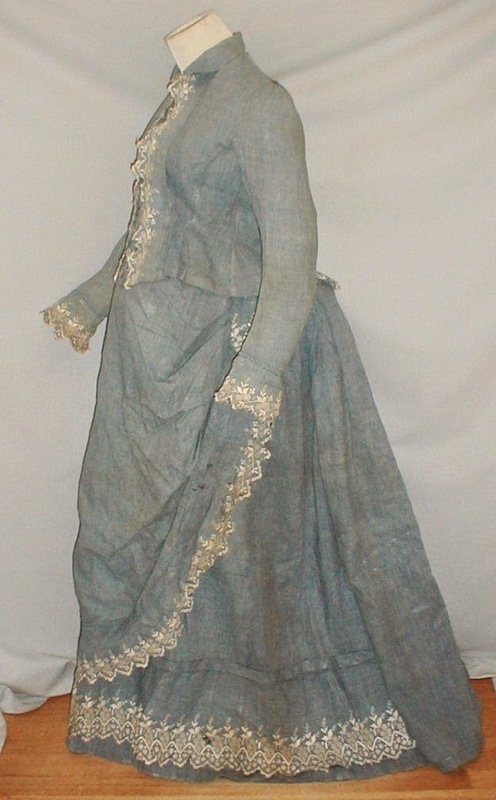 I wonder if this was worn as a wedding dress because of the embroidered wheat motifs? Wheat symbolized love and prosperity (according to several google searches but I could be wrong). I would seriously doubt it. Wheat is a common motif - sort of more like hearts in our modern clothing. Would this dress have been worn by an expectant lady? The side view seems to indicate that. 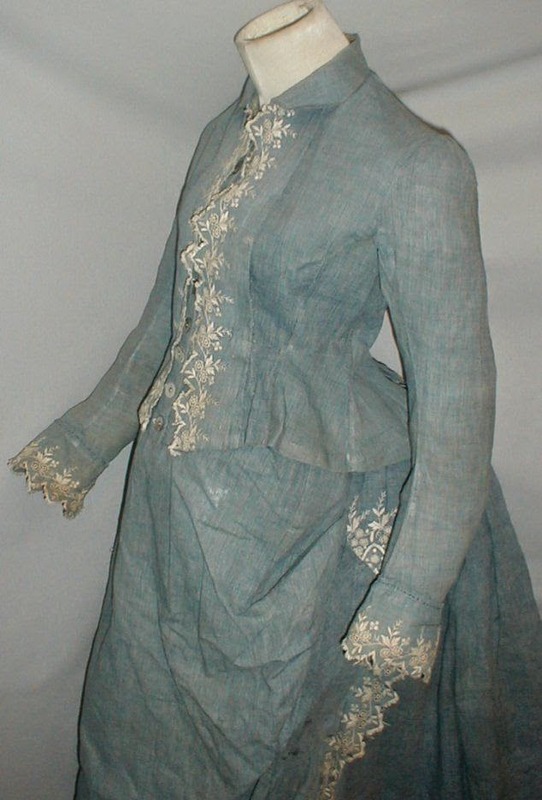 I think what we are seeing is a mix of the early 1870's (waist lines were really high from the late 1860's into the early 1870's) and an antique dress on a modern display - which almost always makes the dresses look weird.